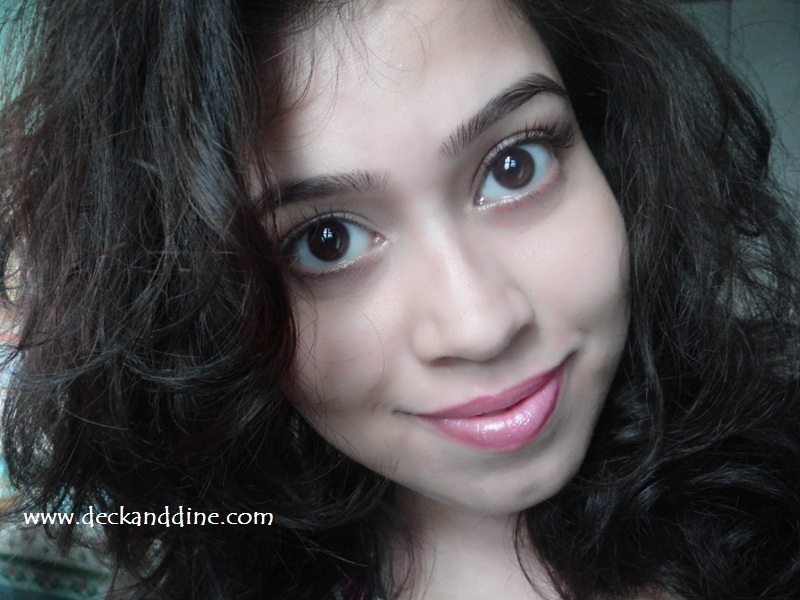 Today I am here with a review on a pink lipstick from Make Up Academy. MUA is one of my most favorite drugstore brands. Great makeup doesn’t need to cost the earth and it is MUA’s promise to bring surprising quality, colour and innovation to each and every product it delivers. The lipstick comes in a glossy black case with the shade sample pot at the bottom, which when twisted off can be applied with a brush. A pale pink loaded with shimmers. When you see the bullet you have a feeling of chunky glitters on it. But when applied on lips, the shimmers don’t look too cheap or loud. The shimmers add a silver sheen to the pink lipstick. Astonishingly, it looks cute and gentle. But I don’t think it would suit dark skinned beauties. It is a shade meant for light complexions. Creamy, moisturizing and smooth texture. Goes really smooth and nice and doesn’t feel sticky or heavy. 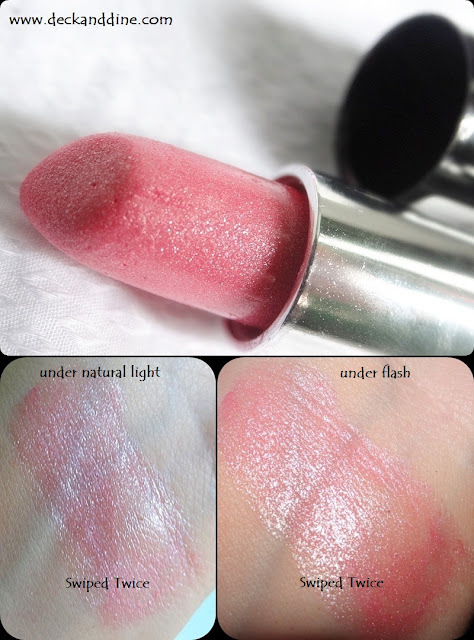 The formula is truly light weighed and leaves a healthy glossy sheen to lips. It tends to be sheer on a single swipe but is easily buildable. It provides medium coverage and would be able to hide minor lip pigmentation. Very pretty shade. Looks soft and feminine. The shimmers in the lipstick look gritty, but don’t feel so. The shimmers look much muted on lips and never felt harsh on my lips. The shimmers don’t stick on the lips or spread everywhere. They vanish from lips with the lip color. Staying power isn’t that great. Might washout dark skinned beauties. The bullet has a tendency to melt in summers. I love the color. It is quite glittery but luckily the chunky glitters don’t show up on lips that much. But whatever, I'm not a big fan of glitters and this is the only reason I won’t go for this lipstick often. Otherwise the color is pretty, texture is soft, smooth, moisturizing and color payoff is medium buildable. Moreover, at this price tag, I can’t ask for more. 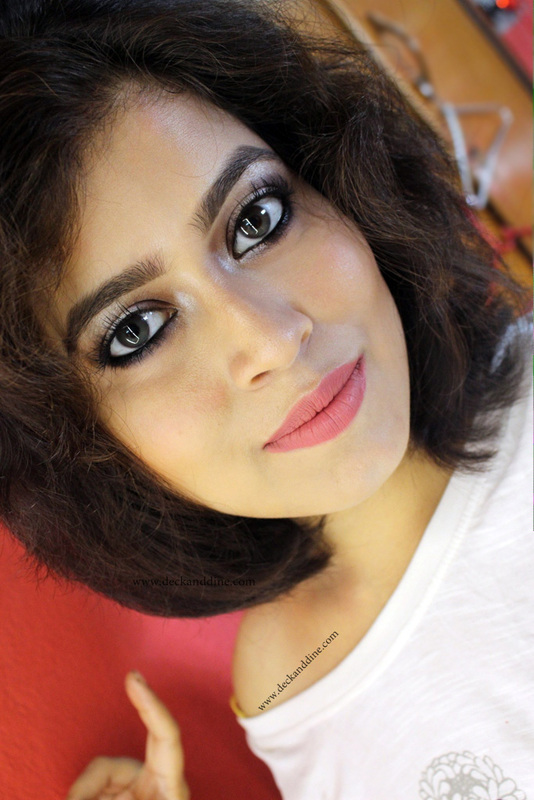 If you are fair-medium skin toned and are comfortable with frost finish, then you can surely give it a try. 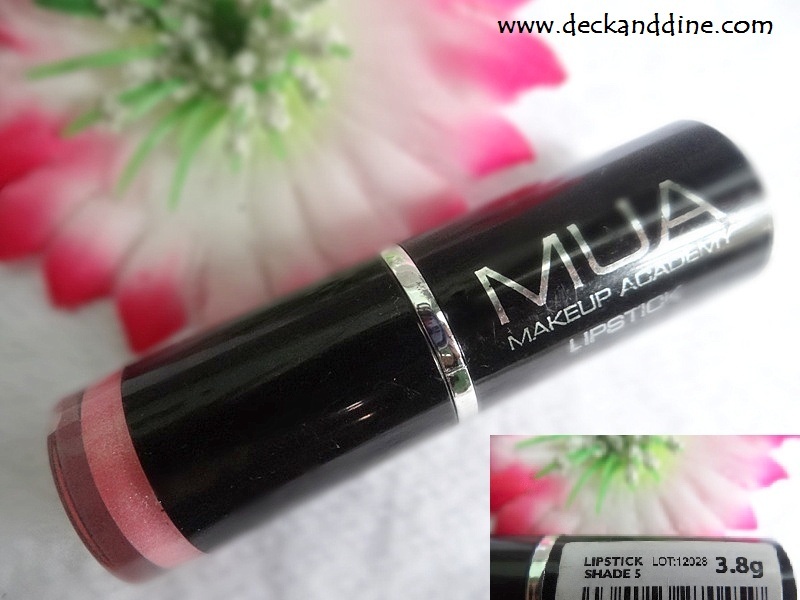 Would I repurchase MUA Lipstick in shade number 5? No, not this particular shade, but would like to try their other shades. Looks so natural yet juicy. :'( kinlam na kano eta!